Perhaps what I appreciate most about gardening in the south is the fact that it is year round. While many of the deciduous hydrangeas are loosing their foliage, the Arum groundcover is coming into its own and will soon blanket the ground. Then there are the shrubs that bloom a second time. Above, the Chinese Witchhazel (Lorapetalum chinensis) in its second flowering. 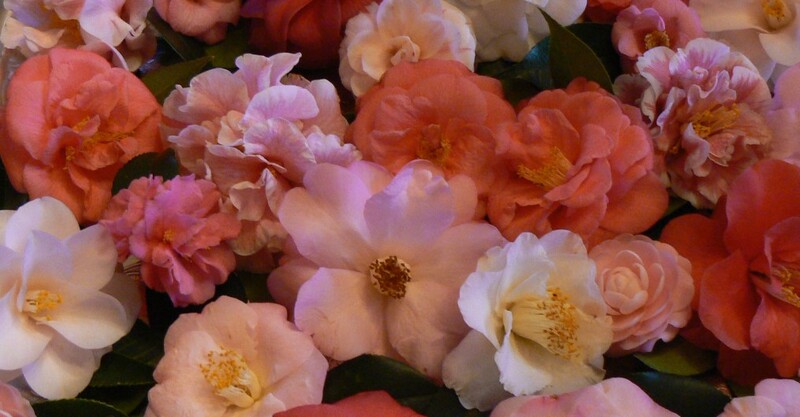 For the rest, far from looking bare the camellia sasanqua are putting on quite a show. From a distance they could be mistaken for cascading roses …. Close up, just as enchanting with as much diversity in form. The potager is done with the summer crop and we are now planting garlic (late), seeding lettuce and arugula, planting kale, cabbage and broccoli. Believe it or not the summer peppers are still going strong, I just harvested these…. When the summer wildflowers die down I can see the bee hives…. wish you could taste the honey…. No, we don’t do that, we have a beekeeper in fact the bees are his, we just supply the nectar and then share the honey, good deal!